SQUIDALICIOUS: Get Inspired, Donate Vaccines, and Save Lives for Blogust 15! 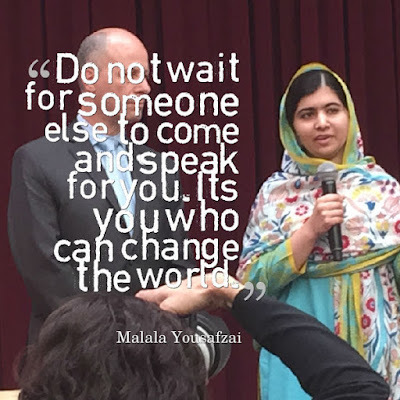 I love this quote from Malala, once of my and my daughters' personal heroes! And such perfect timing since the movie "He Named Me Malala" is coming out soon (in October). Thank you!! Can't wait to see that movie. Thanks for commenting. What a wonderful quote and beautiful post. Thank you for your part in #Blogust! Thanks for commenting and donating one more vaccine! This is a great idea. Thanks for giving it voice and putting it out there. It is a great idea, isn't it? I'm so honored to volunteer for Shot@Life. Love this quote, from one of the most inspirational young leaders around! Thanks for sharing. Malala was indeed amazing. Thanks for your vaccine-donating comment! Thank you! Good luck with your cause as well. Such a great quote, and something I strive to teach my kids: Speak up! Glad to be part of Blogust with you. What a fantastic quote! I am so happy to be on a Blogust team with you again. Vaccines work!! Oh yes, the reunion squee factor is high. Thanks for helping to get those working vaccines to kids who need them. Happy #Blogust to you too! My 8 yo is reading a biography about Malala right now. I told her that Malala is proof that kids can change the world and that it is important for her to stand up for what she believes in. I think that Malala would be happy that people are thinking about what she said about speaking up for justice wherever one is and that vaccines are getting donated at the same time! I hope so. And I hope your 8 yr old blazes bright and makes a difference, too. I'm so happy there's a #Blogust! It's a great campaign. Thanks for helping out. And make vaccines available to everyone who needs them. Yes. Completely agreed. Thanks for commenting. I'm so proud of you and #blogust for this critical work! Thanks for (yet another) donation with your comment!